Dr Tonia Gray has been a long term advocate of the place of Health and Physical Education, and in particular Outdoor Education, in the school curriculum. As an undergraduate student at the University of Wollongong from 1989 – 1992, I was inspired by the passion that Tonia displayed for teaching and learning in health education. When I returned as a post graduate student in 1994, Tonia was leading the way in teaching and research in the field of outdoor education. Tonia’s leadership in this field has continued for over twenty years and during the recent development of the Australian Curriculum for Health and Physical Education, she has played an integral role in positioning Outdoor Education as a key component of Health and Physical Education learning for all Australian students. Tonia has been an outstanding educator and advocate in the field of outdoor education for more than 25 years and thoroughly deserves to be nominated for this award. I strongly support Tonia’s nomination for the Office of Learning and Teaching National Teaching Excellence award. 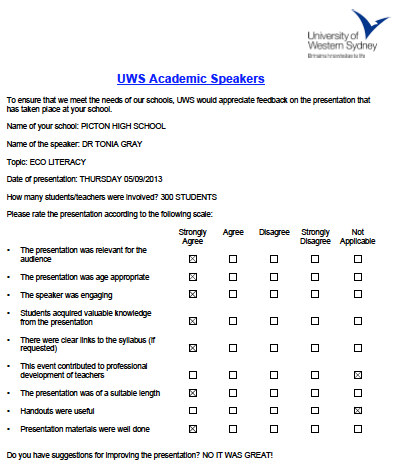 Picton High School evaluation of Tonia Gray’s presentation. commitment to her subject and the way she encourages student engagement in all aspects of her teaching. She has a thorough knowledge of her subject matter and it is obvious on observing her with a group, that students love her classes. The relationship she develops with her students on such a personal level, create enthusiastic life-long learners with a passion for the natural environment and their chosen profession of teaching. For some twelve years pre-service teachers working toward their degree in PD/H/PE teaching have led valuable learning experiences at Mt Keira Demonstration School under Dr Tonia Gray’s guidance… The learning experiences that I have witnessed at Mt Keira over the past three years of my principalship here have been very impressive. Very impressive for the development of both your pre-service teachers and my students. … a well organised, exceptionally enjoyable and outcome laden activity from the PD/H/PE program is beneficial to your pre-service teachers. Today I invited parents from my community into school to take part in the last day of this learning experience. As a pure PR activity, this one is a winner!! Every small group of parents I chatted with were very excited by the smiles on their children’s faces, by the quality of the experiences being offered and the enthusiasm being displayed.